A job in the mining industry could be dangerous without durable wire rope. No matter what the job entails or the safety requirements are, Nevada’s and California’s active mining industry trusts our full-service wire rope specifications and abilities. Our mining rigging supplies offer industry standards and safety to ensure as much protection for all of your jobs as possible. We work and train you and your team to provide you understand how our rigging supplies work. Silver State Wire Rope and Rigging prides itself in providing rigging training to mining companies so they have a better understanding of our products and how they will work in the mining environment. We want our clients to leave our facility with full knowledge of how our products work and the safety we pride ourselves in providing. When your employees’ lives are at risk for their jobs, it is essential to provide safety and the best in mining supplies to keep them from danger. Silver State Wire Rope and Rigging has a training facility so you can test our wire rope or rigging products with your entire team. We have a team of specialists who will go over every rigging supply your company needs to maintain the highest level of safety for your organization. Mining is a vital industry in our southwestern region of the U.S., and it’s also an industry that requires the safest procedures to get the job done right. At our facility, we train for rigging with safety in mind so that your job site remains secure. Our mining rigging supplies are made to the best industry standards so you know they are durable and will protect your workers from a hazardous incident. We test out every product before you receive the supplies so we can verify they are up to par for your industry. 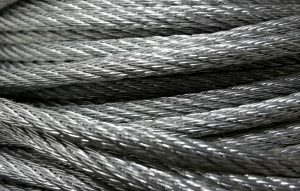 You will feel confident with Silver State Wire Rope and Rigging supplies. Our facility is equipped to provide industry standard training for all our mining supplies. Safety is the number one priority of our company so that you will feel confident about all of our products. Contact us today for our mining rigging supplies and training.